Simply complete the short form for Free Kenra Hair Spray Sample. This sample is targeted to salon professional. This is a great product to apply under your regular facial moisturizer daily! It’s very sheer and contains SPF 50 which is really nice! I love that it applies so easily, dries quickly and leaves my skin feeling soft and smooth! It doesn’t leave behind any kind of white residue or anything like that which I really like about it! Also, another really nice point about this facial sunscreen is that it leaves your skin with a matt finish instead of that glossy shine you’d expect to see. I love the matt finish! In conclusion I can say this sunscreen is very effective because I didn’t get sunburned so much as one day that I’ve used it so I highly recommend it! If you’re interested in trying Exuviance Daily Protector SPF 50 for yourself you can find it HERE. I was mailed a sample of Hask Monoi Coconut Oil Nurishing Shampoo with the matching conditioner set! I’m so excited to have been selected to review it because it’s absolutely wonderful! Just opening the bottle and smelling it and it’s so divine! I’m in love with the scent so much I could just stand there smelling it! I’ve been using it for about 2 weeks now and it’s honestly really made a huge difference in my hair. Before my hair was unmanageable and seemed straw like even though I don’t have color treated hair. My hair type is thick, long and my color is natural and untreated. I don’t use products in my hair like mosses, hair sprays, etc. so I don’t know why my hair seemed to have a mind of its own before. First I started with the Monoi Coconut Oil Shampoo and applied their Nourishing Deep Conditioner. I left it on for 10 minutes like the directions said. The results were AMAZING! The following day I used the shampoo but this time instead of the deep conditioner I used the Monoi Coconut Oil Nourishing Conditioner in place of the deep conditioner and it did a wonderful job also! It’s very light and didn’t weigh my hair down but really helped it lay straight which was exactly what I was looking for! Once my hair is dry I finish it off with a couple drops of the Monoi Coconut Oil Nourishing SHINE® Oil which I absolutely love I might add! Before I was selected to try their products I had never heard of their company. I can tell you I will defiantly be purchasing more when I run out. I feel silly saying this but I don’t know if this is a salon brand or a store brand. I read a review another reviewer posted saying they purchased theirs from Walgreen’s. If that’s true I don’t believe it because this product looks smells and preforms like a high end salon brand. Here is the link to the HASK Beauty Website CLICK HERE. Well, I was in the market for a full set of make-up brushes but didn’t want to spend a small fortune on them. Yet, at the same time I want to make sure I made a quality purchase. 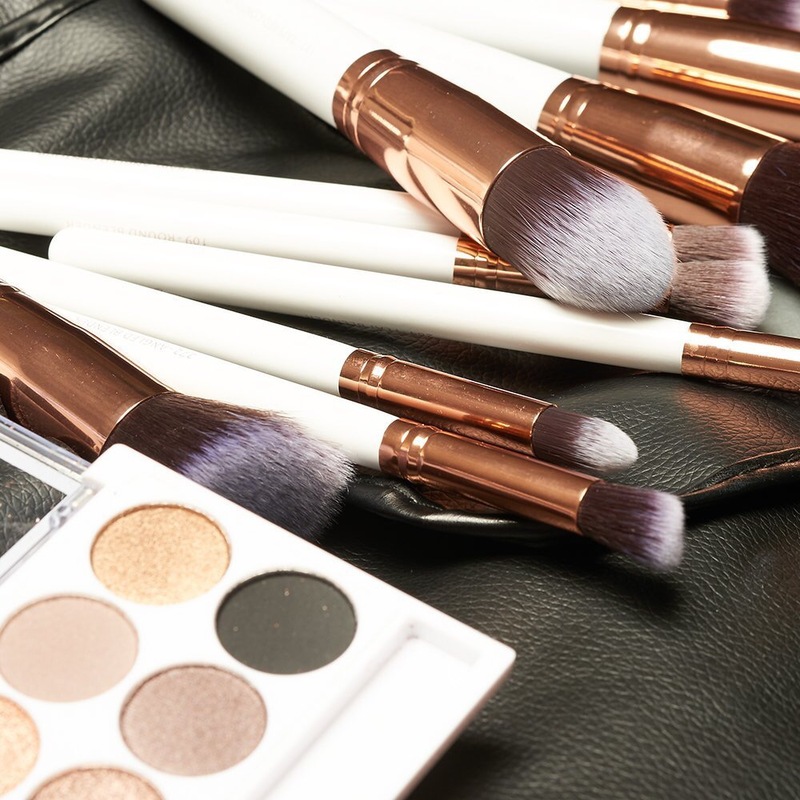 After scouring the internet and reading so many reviews it made my head spin I stumbled onto this gorgeous set of brushes by Beauty Widgets! 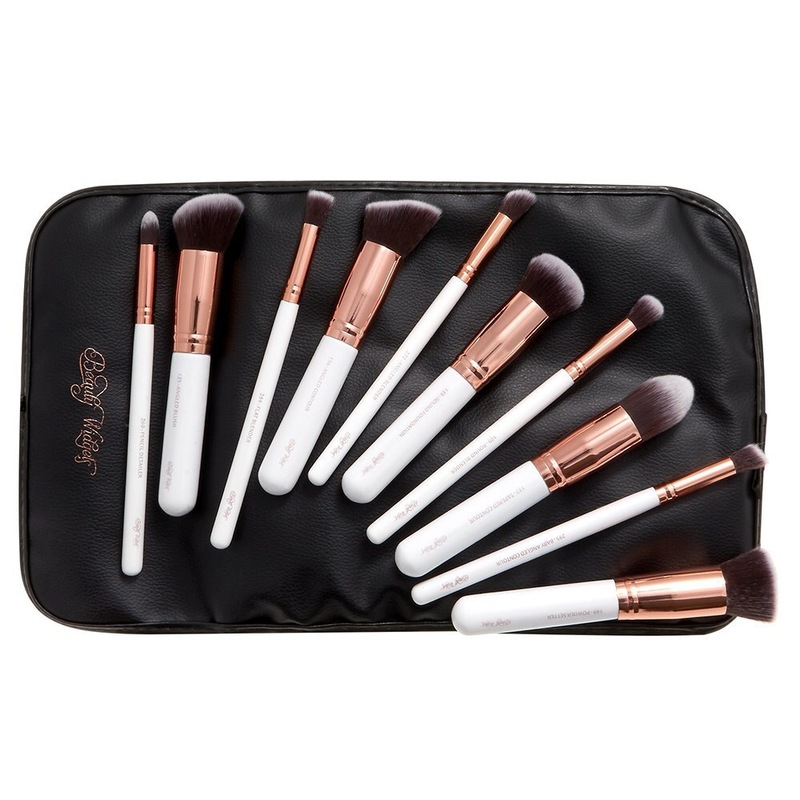 This set comes with 10 make-up brushes and it even includes a black roll tie makeup bag to store them is so they stay nice and clean when I’m not using them! I was so excited to get them in the mail because they are truly beautiful. This is a synthetic set so they are not exactly made of horse hair or anything exotic but if that’s what you’re looking for then this isn’t the set for you and of course you’ll be paying a lot more if that’s what you want. Another thing I love about this set is that each brush is labeled so you’re not guessing what it’s for. The roll case it comes with is made of a plastic and it’s not that nice but I’m more interested in the quality of the actual brushes anyway. I highly recommend this set! I’m so extremely impressed by the Billion Dollar Brows Kit! All I can say is WOW! I’ve tried several different brands of brow products from high end to drug store brands and I really like every piece in this kit! The Universal pencil is truly universal and blind is perfectly, applies smooth and has great coverage! The attached blending brush on the end of the pencil comes in very handy and I love that the two are attached to make life easier! The concealer/highlighter pencil applies smooth with minimum application for a perfect coverage every time. I apply the highlighter directly under my eyebrows and use the blender brush to blend it in. It makes for the perfect look! I love how natural it goes on for everyday makeup and when going out I can apply it heavier for more of a night time make up look. As for the clear brow gel, it goes on clear and sets my brows perfectly! Every hair stays perfectly in place and once it’s dry you can’t even tell it was applied. It’s like hair spray for your brows. All in all this kit was exactly what my brows needed! I know a lot of women skip eyebrows when doing their make up because they don’t seem to be important but I’d like to remind you that when you age the very first place people notice signs of your age are in your eyes. Well, having manicured brows help with the appearance of a more awake youthful appearance by creating a more open appearance instead of that heavy lid look. Just throwing that out there! Other than that, having manicured brows creates a more refine finished look like having manicured nails and a pedicure. If you’d like to treat yourself to a Billion Dollar Brow kit you can enter for a chance to win a kit by entering the Billon Dollar Brow giveaway or you can find it for sale on by click HERE and HERE! **Brow Gel: Our clear brow gel locks in your look, giving your eyebrows a long-lasting, radiant glow while keeping them perfectly in place all day.